Container Pontoons - RCP B.V.
At Ravestein you can find new and/or used Container Pontoons. 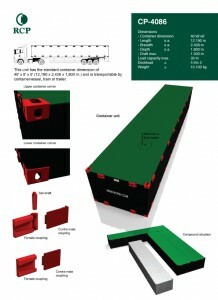 Ravestein Container Pontoons are available for hire, lease or purchase. Just click on the different Container Pontoon types, and detailed information is available. 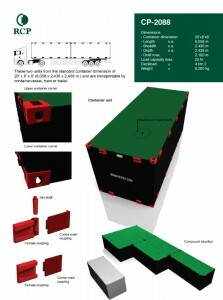 Of course we like to help you if you have any questions about Container Pontoons! The Ravestein company is market leader, we build all types of pontoons. 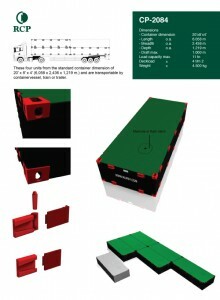 Ravestein designed an entirely new system for connecting pontoons, known as the dovetail coupling system. The incentive behind the dovetail coupling of pontoons came from questions from the market, and the experience acquired in constructing connectable pontoons on commission. The new coupling system had to replace existing systems. It had to be better, stronger and easier to use. Another condition was that it had to be efficient and economical. This lead to an innovation process which resulted in pontoons shaped like standard ISO containers, which can be coupled together using wedge shaped (male and female) dovetail couplings. The top couplings have a pin to prevent the pontoons from sliding loose once they have been coupled. The couplings are welded into the pontoon shell in such a way that various configurations are possible. 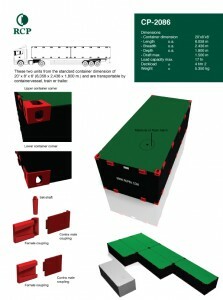 RCP BV can help you with coupling container systems!